The visitor votes are in and the winning 2018 animal redevelopment project is the Sumatran tiger enclosure. Since the summer holidays we’ve been asking all visitors who add the ten per cent voluntary donation to their entrance fee to vote for one of three major projects, involving either tigers, chimpanzees or bears and we had a clear winner at the December 31 deadline. 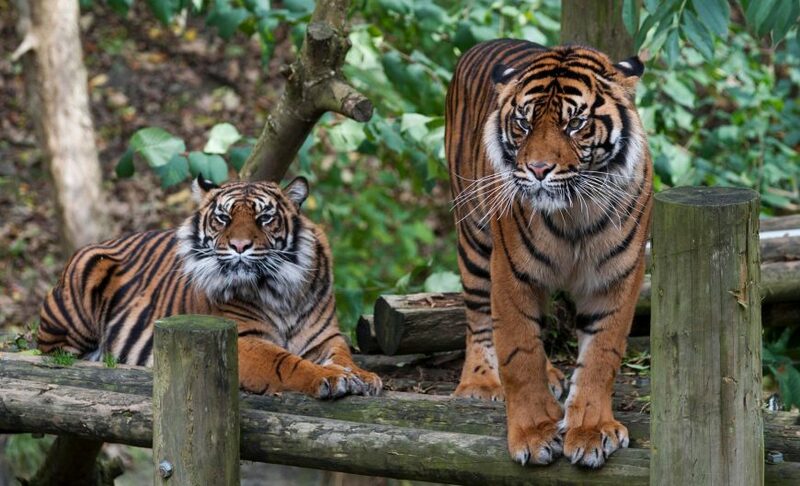 DZG Curator Richard Brown, said: “We’re planning to start work on the big cat enclosure in September. “The redevelopment will include levelling the tiger house and rebuilding it with new off-show and on-show dens, which will create new indoor viewing areas if the tigers are inside. Following the success of the token voting system, which proved a great way to canvas the opinions of our visitors, we’re restarting it again for 2018. The two projects from last year – reinstating brown bears into the restored Bear Ravine on the lower zoo site, alongside new dens and climbing frames, or adapting the fencing in the chimp enclosure to enable us to introduce males to the current all-female group, are remaining as options this year, while we’ve also added the new separate outdoor enclosure for our Bornean orangutans as the third choice.